In an effort to close one of my other blogs that I don't use anymore, I'm going to be reposting things in here. The first is, of course, food. Now as awesome as they are, there were things in there I couldn't do. For example, veal. I don't do veal. I wasn't too keen on the idea of milk in my meatballs*** either. However, I followed the basic idea of the recipe- as in baking them. I even went a step further and used them to make a tomato/red gravy/sauce*. Here's my interpretation of the meatballs. And my friends, it is REALLY worth it, either with the original or my alterations. It's best to use dried herbs for this because it's not going simmer on the stove/in a crockpot like it should be. Combine the tomato products with the herbs and blend it well; make sure the paste blends through- there should be no lumps. Allow this to heat through for about 1/2 an hour before proceeding to the second part. Mix the meat and eggs together by hand. It's squishy. Deal. Add the onion and garlic, and mix well. In a 13X9 pan with high sides (or use a dutch oven if you have it), take a ladle or two of your gravy/sauce and coat the bottom. Using an ice cream scoop, make the meatballs. Pack them well; you want to get rid of the air in them. Now pop it out and make sure it's round. repeat with all meat in the bowl. I got about 25 meatballs out of this. Ladle the gravy/sauce over the meatball. 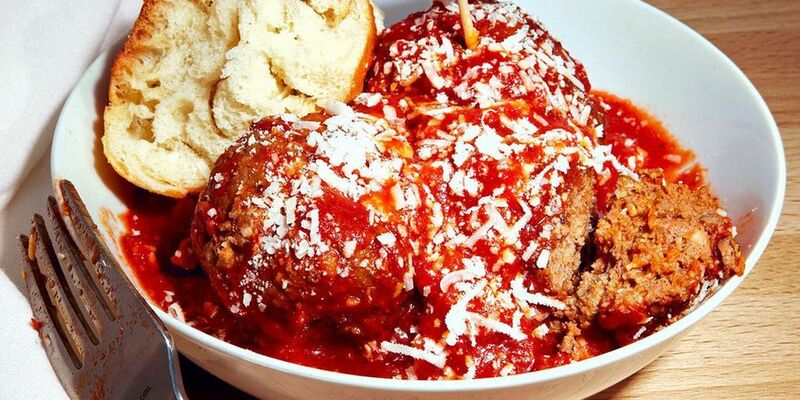 Cover them with the sauce-- make sure there are no exposed parts of the meatballs. Put the pan in the oven, uncovered and cooked for 1 1/2 to 2 hours. Mine were ready in 1 1/2. Serve alone with crusty bread or over a little spaghetti. There should be WAY more tomato sauce than you need. Freeze or refrigerate for future use. I hope yours is as good as mine. 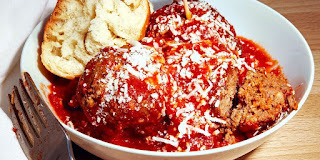 Best Meatballs Ever. My picture is coming; I'm using an old camera**** with a CompactFlash card and I have to go find the cord to up load the shot. I also meant to Pin This to Pinterest last week so that I could have for my October challenge, but I messed up. I won't count it, but I WILL share it. *I hate getting into the argument about sauce and gravy, so I always refer to it this way. However, in my house it's always tomato sauce. **I love adobo. I use it everywhere for everything. ***I have been informed that using the milk with the breadcrumbs is meant to keep the meatballs moist; it's an interesting concept and I may give it a try next time, but these babies were plenty moist. ****That camera thing is a whole other post. Argh.